This week I’ve found the perfect EASY craft. 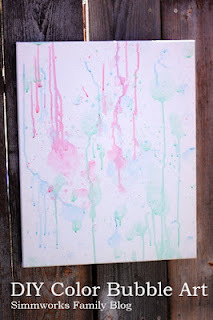 It’s fun for the kids and makes great artwork to hang in the house or playroom. Really, what kid doesn’t love bubbles? My kids love bubbles so much that we have to buy them in the gallon size. We go through them that quickly! And I’m excited to announce that my daughter now says bubble with no prompting. Clear as day! How cute is that? You only need 5 things for this project! Most of these are probably in your home already! Don’t feel like you have to go out and purchase a canvas for this artwork. You can use a piece of paper, cardboard, or cardstock. Anything you have lying around! If you love it enough, just frame it later! You can quickly change out the artwork as your kids create new masterpieces! 1. Add food coloring to your bubbles to make your desired colors. Remember, a few drops go a long way! 2. Get out a variety of wands and tools to help make different patterns on the artwork. Small and big bubbles alike look equally as cool. 3. If you have a bubble container lying around, fill it with some bubbles and add some food coloring right to the container to create an easy-to-use option for younger kids. 4. Start blowing bubbles towards the canvas! 5. If the bubbles don’t go directly onto the canvas you can always just get closer like my son did and make them blow onto it. Feel free to change up the colors and size of the bubbles by using different wands. It helps when Mommy and Daddy get involved too. That way the kids can blow the bubbles and pop them! 6. Then enlist an official bubble popper to pop all of the bubbles that are still on the canvas. 7. Allow artwork to dry then hang wherever you see fit! Where would you hang bubble art in your home? Every week Danielle brings great kids crafts to Formula Mom! Danielle is a work-at-home-mom of two beautiful kids and writes at the Simmworks Family Blog. This looks like, definitely need to try this with my 4 year old, she’d love it. This is SOOOOOOO cute I think my darlings would love this!